The TOA-150 is the second Takahashi Ortho Apochromat to be developed by Takahashi. It features a newly designed triplet objective. This new design like its smaller companion the TOA-130 is absolutely color free. The 179mm oversized tube was used to provide superior baffling and extremely high contrast. Knife edged baffles inside the tube help provide this great contrast. The high contrast and total lack of color makes the TOA-150 not only an outstanding optical instrument, but it can be used to make outstanding images with a CCD, digital SLR or film camera. Framing the image or placing the ocular in a convenient position is made simple because of the built-in camera angle adjuster that allows the 360? rotation of the camera or ocular without loss of focus. The smooth heavy duty retractable lens shade allows the length of the TOA-150 to be reduced to 38� for easy transport to remote sites. Attaching the Extender TOA converts the 150 into and f/11.68 planetary instrument capable of very high magnification images. It maintains the color correction and flattens the field. The Takahashi TOA-150B employs a newly designed triplet using special elements to produce the highest order of color correction. Orthoscopic means perfected visually and Apochromatic means you're free from those strange violet glows which often accompany bright stars or planets. Thanks to the ingenious design of layering an FPL-53 Extra-low Dispersion glass element between two extreme quality crown and flint elements - perfection ensues. And what's more, it's air spaced, so there's no oil between the elements to leak or become opaque with age. The lens cells are durably constructed to withstand transport - yet are fully able to be collimated should the owner wish to make adjustments. With 1/12th wave accuracy and an airy-disc Strehl ratio of 0.992, the optics on the Takahashi TOA-150B Ortho-APO are as near to perfection as you can get! The Takahashi TOA-150B Ortho-APO is a dream come true for those who want to use a medium format camera. 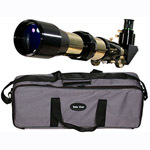 It includes a newly designed 4" focuser that uses a long stroke linear bearing designed to handle heavy instrument packages with ease. LIke the FSQ-106ED, the focuser on the TOA-150B uses a trigger lock focus lock and has a new pinion assembly. A camera angle adjuster is included, and enables the observer or astrophotographer to turn the ocular or camera 360 degrees to better view or frame an object to be photographed. 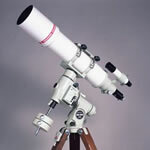 The 4" focuser, coupled with the optional dedicated flattener, will produce a fully usable 90mm diameter image circle. But that's not all. The focuser itself offers a generous 225mm of backfocus to allow the use of additional accessories, like adding on color filter wheels, etc. What's more, the focuser itself offers "no slip" stability with dual knobs for ease of use, 10:1 Micro Edge Focuser and 2" threaded eyepiece/accessory holder with 1.25" compression ring eyepiece holder also supplied - along with Scopeguard finder quick-release. 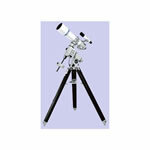 The Takahashi TOA-150B Refractor is perfect for visual, CCD and classic astrophotography. 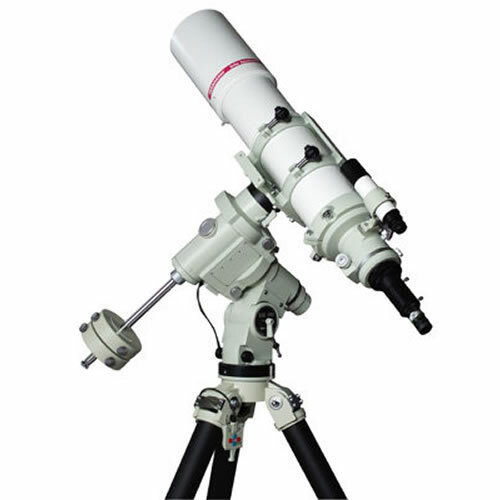 The f/7.3 focal ratio with a 1100mm focal length is long enough for high magnification observations of the Moon and attaching the optional Extender TOA converts the TOA-150 APO into a f/11.68 planetary instrument capable of very high magnification. You'll get images which display.the high order of color correction of the Ortho-Apochromat Series without saturated color and, thanks to the numerous knife-edged baffles, it displays amazing contrast - all packaged in a short, 38" tube with the dew preventive lens shade retracted that weighs just under 43 pounds. 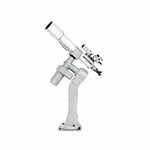 It even has an optional convenient handle at the rear - located just before the focuser - which will allow for an easy grip for carrying and setting up the optical tube. 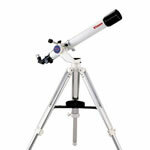 The new EM-400 Temma II mount has been developed to fill the gap between the NJP and EM-500 mount. It has been designed to carry an 85 lb. load. The Takahashi EM-400 mount disassembles into three sections: The R.A./Dec assembly, the base assembly, and the counterweight shaft. 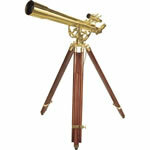 This reduces the heaviest part to 49 lbs (22.3kgs), which is lighter than the weight of the NJP equatorial head. This makes transportation and set-up easier. 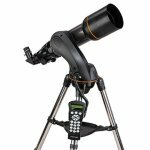 What's more, the entire mount rotates 360 degree on it's base for easier set-up, and allows the tripod to be set in the most secure position. All of the cables attach to the underside of the Dec. housing and the use of internal encoders allows the mount to be used without having the cable wrap around in inconvenient positions. The 8kg. counterweights use two lock screws for more secure attachment to the counterweight shaft. 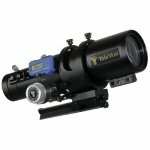 The Takahashi EM-400 mount uses the highly accurate EM-200 computing reticle with an 11X eyepiece to allow three arc minute polar alignment to the celestial pole. This reticle is useable until the year 2040. The EM-400 is a dual-voltage mount that will operate on either 12 volts (500X sidereal) or 24 volts (500X sidereal). The Temma II system is compatible with The Sky and other popular software using the free ASCOM and Linux drivers. 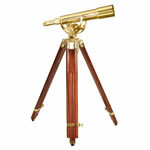 This mount can be used anywhere in the world with a latitude adjustment from 0 degree to 50 degree in either hemisphere.